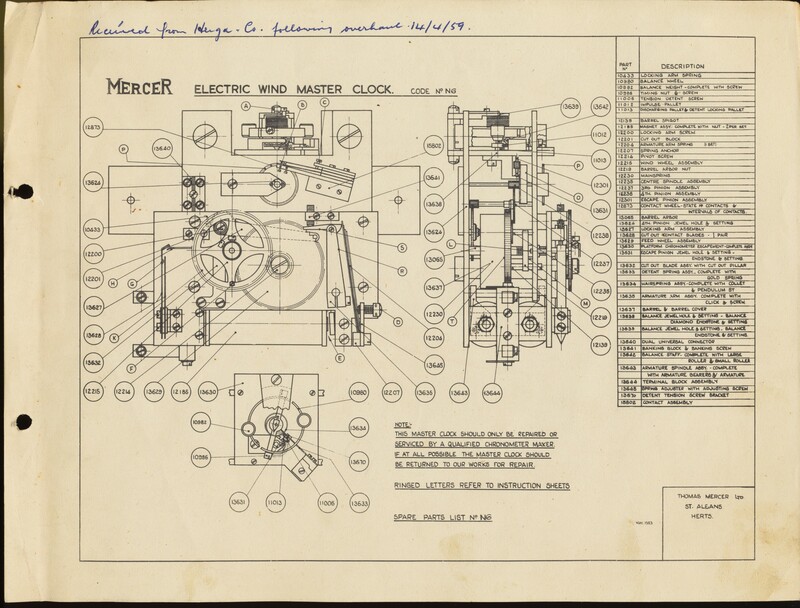 This object is a Mercer Electric Wind Chronometer P2700 (or Mercer Repeating Contact Clock MS 152 according to the manual). While the term ‘chronometer’ is often mistaken to be simply a clock, the term refers to a very specific type of highly accurate timepiece. Chronometers are designed to keep time accurately in spite of harsh conditions such as large temperature fluctuations, changes in air pressure and humidity, and physical movement. For this reason, chronometers were first designed for use on marine vessels, but their high precision made them valuable for timekeeping experiments in harsh conditions. 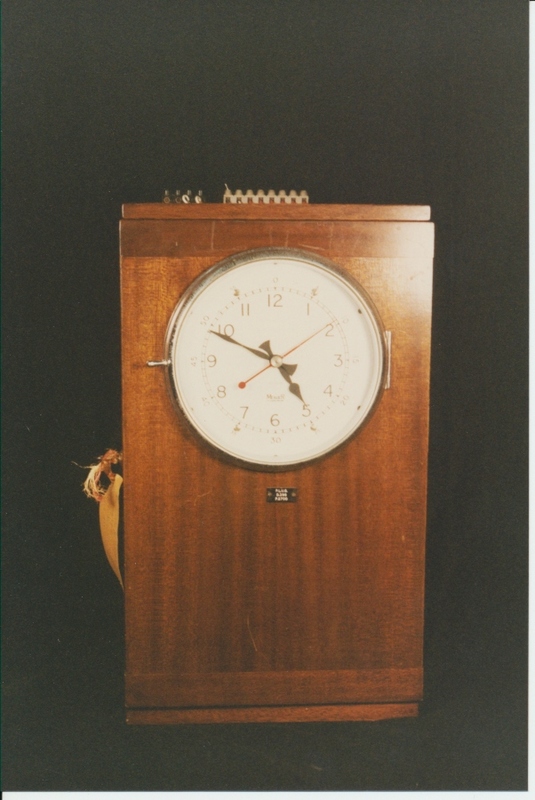 The chronometer consists of a wooden case with a clock face on the front panel. 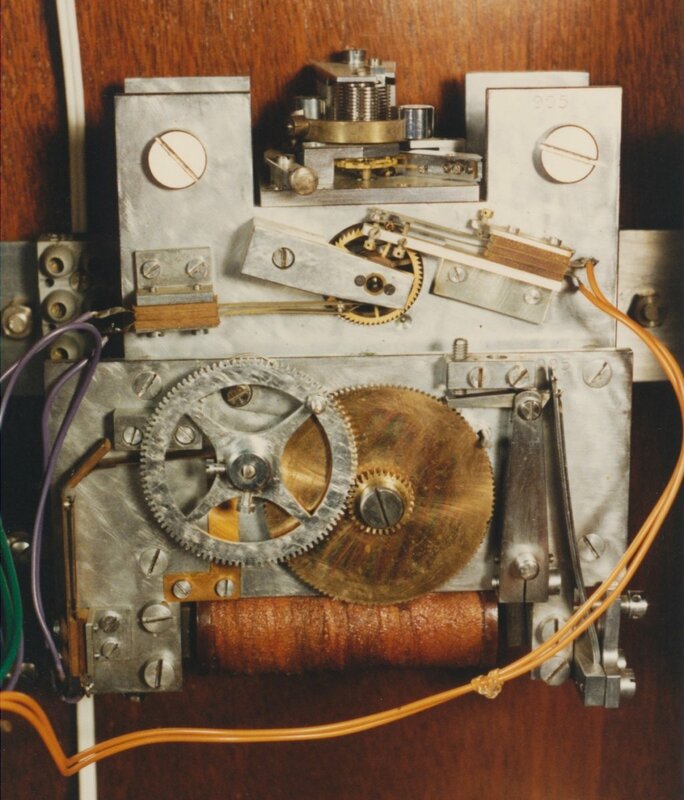 This panel opens on hinges to give access to the main mechanism of the chronometer. This consists of two main components: a mechanical section that functions in a similar manner to that of a regular chronometer, and a mechanism for rewinding the spring that powers the chronometer. As the mechanism of the chronometer ticks, the ratchet wheel moves a pawl upwards. 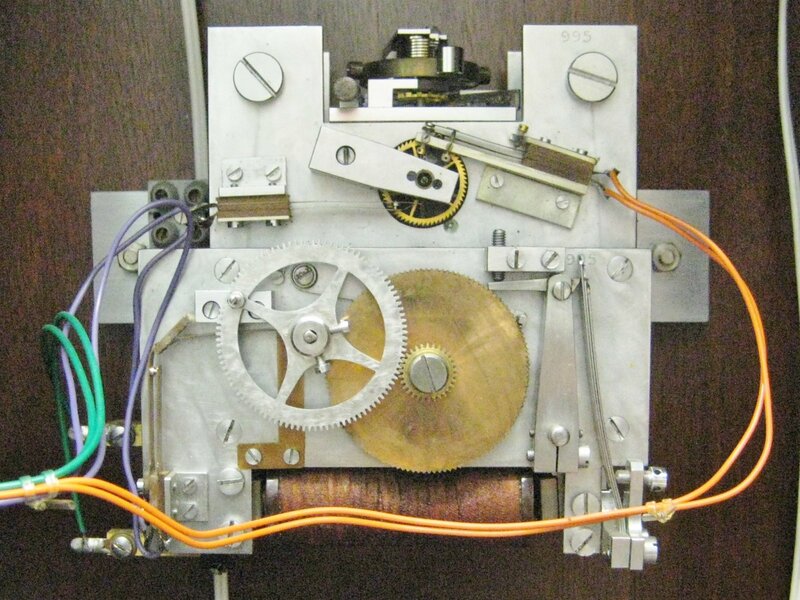 When this pawl moves, it completes a circuit that sends a signal to the dial mechanism on the front of the box. This means that this dial and any others wired in series receives an electrical signal every second, essentially acting as a “second hand” for the dials. In a similar fashion every half-minute, the ratchet wheel completes a second circuit. When this circuit is complete, it powers the large electromagnet situated undeath the internal mechanisms. This magnet, when powered, rewinds the mainspring enough so that the the new tension is enough to power the chronometer for at least another half-minute. 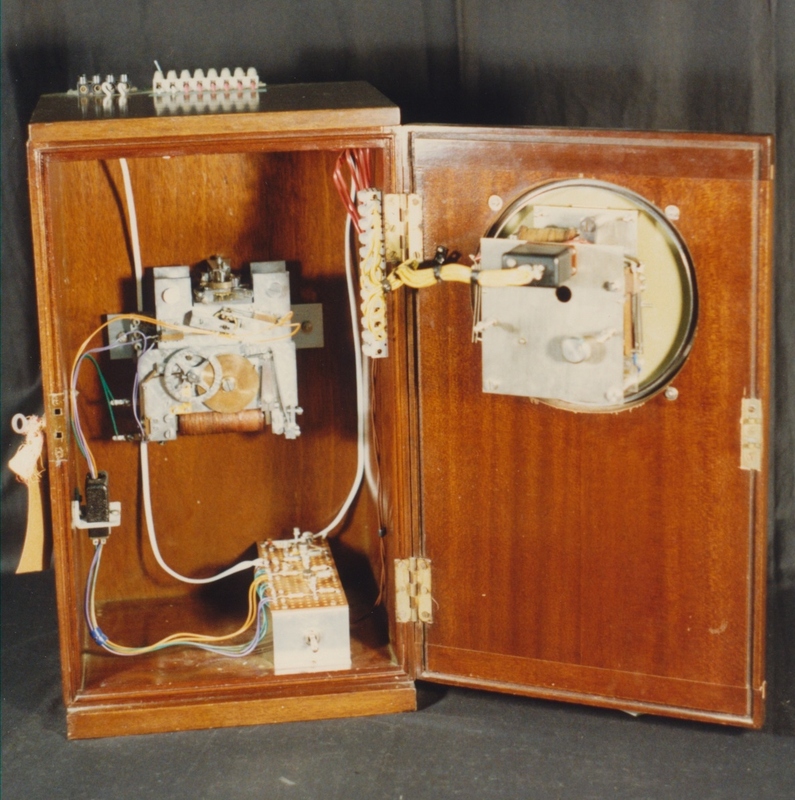 This particular chronometer was used as part of an experiment to measure “whistling atmospherics”, a form of audio-frequency plasma wave in the ionosphere. This experiment was carried out during the 1958 International Geophysical Year across four locations around Australia: Brisbane, Hobart, Adelaide, and Macquarie Island and was run through the University of Queensland. 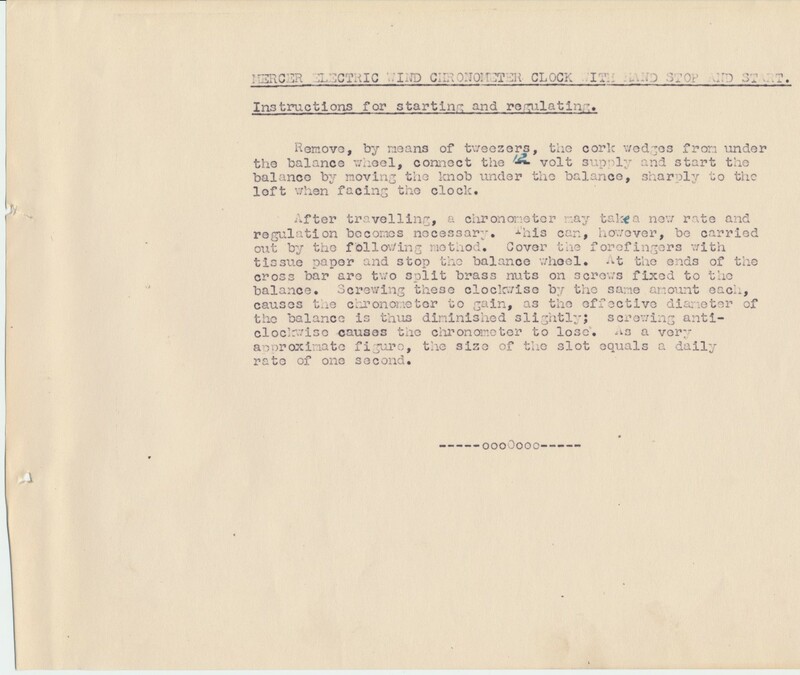 For these experiments it was necessary that the timepiece being used would be accurate in harsh conditions, especially those of Macquarie Island, and remain accurate over months at a time. 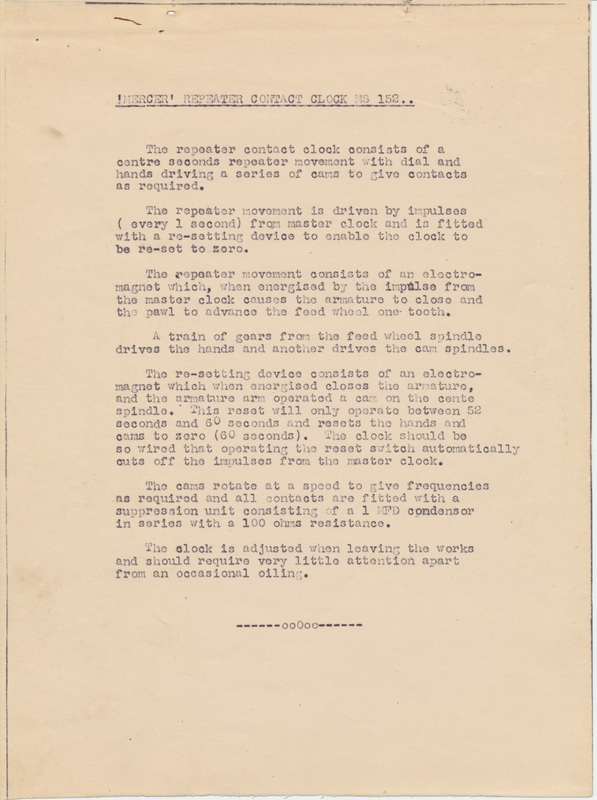 Suitable quartz clocks were not yet available at that time. It was also used from 1963 to 1968 for PhD research into recording satellites by KL Jones. Some electronics were added for use in this experiment. Thomas Mercer Ltd. was set up originally in 1858 in Clerkenwell, London but moved to St Albans in 1874 where it has remained. The company became renowned for their production of highly accurate chronometers and today produces fine chronometers for luxury boats and yachts. CK Aked "Electrifying Time",Ant.Hor.Soc.1977 p32.